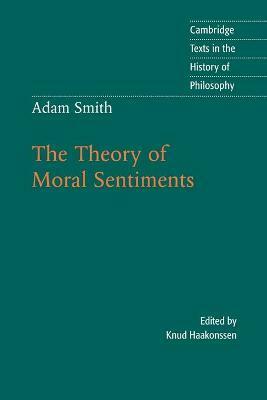 Adam Smith's Theory of Moral Sentiments (1759) lays the foundation for a general system of morals, and is a text of central importance in the history of moral and political thought. It presents a theory of the imagination which Smith derived from David Hume but which encompasses an idea of sympathy that in some ways is more sophisticated than anything in Hume's philosophy. By means of sympathy and the mental construct of an impartial spectator, Smith formulated highly original theories of conscience, moral judgment and the virtues. The enduring legacy of his work is its reconstruction of the Enlightenment idea of a moral, or social, science encompassing both political economy and the theory of law and government. This 2002 volume offers a new edition of the text with clear and helpful notes for the student reader, together with a substantial introduction that sets the work in its philosophical and historical context. Part I. Of the Propriety of Action; Part II. Of Merit and Demerit; or of the Objects of Reward and Punishment; Part III. Of the Foundation of our Judgments Concerning our Own Sentiments and Conduct, and of the Sense of Duty; Part IV. Of the Effect of Utility upon the Sentiment of Approbation; Part V. Of the Influence of Custom and Fashion upon the Sentiments of Moral Approbation and Disapprobation; Part VI. Of the Character of Virtue; Part VII. Of Systems of Moral Philosophy.